The Rangers are fired up and who is the biggest bat in the AL West, Jonathan Lucroy! 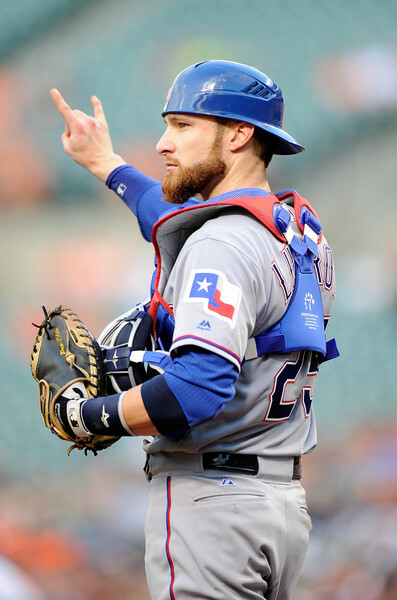 #LuvLucroy, I am a fan, It has been a long time since the Rangers have had a professional catcher. Lucroy is AMAZING not only behind the plate but up to it. In the last 7 games Lucroy stats are .313/.450/.938 He has hit 5 home run in the last 7 games. I knew when we got him he was going to be good, but I am in absolute shock in how good he has been. Adrian Beltre agrees he was recently talking about Lucroy and his presence on the team. We knew when we acquired him he was a good hitter and good catcher, but he’s been above what we expected. It’s nice to see him not only swing the bat well but call a good game and play a mentor for the pitchers that we have. Lucroy is a professional catcher, he has been a catcher his whole career and started catching at he age of 12. The coach’s son Lucroy was the only one willing to catch so his dad gave him the job and the rest is going down in MLB history. Lucroy is a workhorse he goes to the pitchers and they have meetings on how they are going to work a game. This is a new and exciting addition to the Rangers playoff game plan. Well back to baseball, The Rangers have some more sad news Two of the guys are on the DL. One of newest pitchers Lucas Harrell has a right groin strain. He is on the 15 day DL and the Rangers have brought back Nick Martinez to replace Harrell. The more pressing sad news is Shin-Soo Choo, he was hit by a pitch during the Oakland series and has broken his forearm near the wrist. On August 17 he had surgery and had a plate inserted into his arm. You may remember that this is what happened to Rangers catcher Robinson Chirinos, who took 60 days to come back. With this kind of injury there is not a real timeline when Choo could come back but, it is a safe bet that he is out for the remainder of the regular season. Ryan Rua has been called back from Round Rock and Jurickson Profar has been playing in the outfield. This week the Rangers will play three in Tampa to take on the Rays and two interesting interleague match-ups in Cincinnati to take on the Reds. Baseball has been a passion for me. I was always THAT girl who knew more about the game than most boys. When I met players we would talk about the inner workings of the game. Now I share my knowledge and passion for baseball with you.